If you are a regular reader of The Tattler then you are certainly familiar with the Southern California Associations of Governments, or SCAG. These are the same guys who have often dragooned us into accepting Regional Housing Needs Assessment (RHNA) numbers that require us to plan for the building of all varieties of stacked infill development in town, even though nobody living here actually wants it. They then turn down our appeals of their nonsense, along with the appeals of a lot of other cities. SCAG does not enjoy hearing from any community that does not intend to bow to their development commands. It is not what they're here to do. SCAG's authority on mandates such as those unwanted RHNA numbers is backed up by a central planning regime in Sacramento, which in turn takes its orders from a state legislature totally in thrall to the development and Realty lobbies that never fail to fill their campaign coffers. It is corruption at its most profound, and yet one more indication of how our state government is not exactly helping economic and community life in California. It must be recalled that SCAG does have a track record for making disastrous, and at time hilarious, projection errors. You may remember that back around 2006 one of the more repeated arguments in favor of high density overdevelopment in our downtown area (the now widely disrespected "Downtown Specific Plan") was SCAG's "visioning" prediction that millions of new residents were on their way to California, and that unless we built to accommodate the needs of all of these new arrivals there would be massive housing shortages. Current demographic data shows just how wrong SCAG was. The great California exodus of this decade has led to a population stagnation here, leaving a significant amount of the high-density development built on SCAG's recommendation in the previous decade unsold, and a glut on the market even today. So it is hardly surprising that SCAG should have awarded an economic basket case such as San Bernardino a "planning award for prosperity." Here is how this astonishing news was announced on blackvoicesnews.com May 11 of 2011 (click here). City Wins SCAG's Visionary Planning Award For Prosperity: The City of San Bernardino won the 2011 Compass Blueprint Visionary Planning Award for Prosperity, Mayor Patrick Morris announced on Tuesday. The award was presented by the Southern California Association of Governments at its annual general assembly awards dinner May 6 at La Quinta Resort & Club in La Quinta. The Compass Blueprint Award is considered to be one of the highest achievements in government in Southern California, going to the region's most outstanding projects in planning, development and quality of life. "This award acknowledges the hard work being done in our community to create better opportunities for our future," said Mayor Morris. "This is not about just what the City of San Bernardino is doing, it's about what we are accomplishing together." Indeed. In little more than one year later San Bernardino declared bankruptcy, and the press SCAG's award winning city for prosperity started receiving was not complimentary. Here is some lambasting from a 247wallstreet.com article (click here) posted on Yahoo entitled "Sickest housing markets in America." Guess which market is ranked number 1? Riverside is the third California metropolitan area suffering from a sick housing market. In this region, homeowners paying a mortgage have $41.5 billion in negative equity, the fifth-highest amount in the nation. Many of these homes are under water because median home prices plunged by 55.6% from their peak in 2006. The metro had an annual unemployment rate of 14.3% in 2010, the highest among the largest cities in the country (it was 11.8% in may 2012), and 12.3% of homeowners with a mortgage are 90 or more days delinquent on their payments - the ninth-highest rate. According to Southern California's City News Service, the assessed value of all taxable property in the county is estimated to be $204.8 billion for the 2012-2013 fiscal year, a $300 million decline from the $205.1 billion assessment in the previous fiscal year. While the decrease is lower than previous years, it means things have yet to improve. Obviously SCAG's "2011 Compass Blueprint Visionary Planning Award Winner For Prosperity" is in quite an economic mess. But maybe this happened all of a sudden and SCAG was blindsided by a rush of events that brought San Bernardino to such a sorry pass? According to a July of 2012 investigation by the Pasadena Star News (click here), they should have known better. San Bernardino struggled for decades before bankruptcy decision: San Bernardino's fall was not fast. The city has struggled for more than 30 years with a declining job base, dwindling business community and a steadily eroding housing stock. "It's a three-decade long experience," said Mayor Pat Morris, noting, however, that the real blow to the city has come in just the past few years. "Our current dilemma is not so much what happened way back then," he said. "It's what happened since 2007 and 2008." On Tuesday, the City Council, fearing the city would not be able to make payroll in August, authorized City Attorney James F. Penman to file for Chapter 9 bankruptcy protection. City leaders cited immediate cash flow problems stemming from steep declines in tax revenue, skyrocketing pension costs and the state take-away of redevelopment funds. Penman, addressing the Council on Tuesday, said city budgets in 13 of the last 16 years appear to have been falsified, and in a news conference on Wednesday, he said evidence of suspected wrongdoing has been turned over to the appropriate authorities. San Bernardino Wins Eligibility for Bankruptcy - A federal bankruptcy court judge granted the city of San Bernardino eligibility for bankruptcy protection on Wednesday, raising the possibility that the city will propose a plan to dig itself out of debt by cutting money promised to the public pension system. 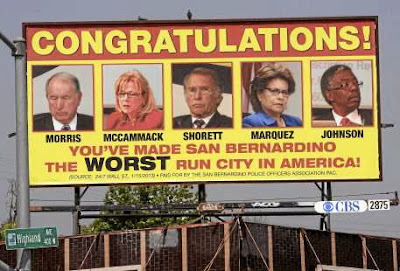 San Bernardino, a working-class city of 240,000 about 60 miles east of Los Angeles, declared Chapter 9 bankruptcy last summer, saying it had effectively run out of money to pay for day-to-day operations, in large part because of pension obligations. Lawyers for Calpers had argued that the city should not treat pension funds like other creditors. For the past year, Calpers has also argued that the city has not provided enough documentation for the court to rule in the bankruptcy case and that the city had ignored warnings about a financial crisis for years and filed for bankruptcy as a matter of convenience. But in her ruling on Wednesday, Judge Jury said that it had been clear for months that San Bernardino was insolvent and that only its most recent financial predicaments were relevant. All of the 10,000 creditors are better served by allowing the bankruptcy to go forward, Judge Jury added. So anyway, there you go. Pray that SCAG never hands Sierra Madre a Compass Blueprint Visionary Award for Prosperity, or anything else for that matter. Financial disaster and ruin is likely to follow.